Armley: Carr Crofts flats proposals submitted | West Leeds Dispatch | News. Views. Get involved! Plans to transform a former cinema and clothing factory in Armley into seven flats have been submitted. Developer Riyat Associates wants to transform the former Perry Clothes factory building off Carr Crofts into what it describes as “quality designed, affordable self contained flats and bring back into life [a] redundant building”. The site has been empty since previous incumbent Perry Clothes closed eight years ago, and the two-storey building was badly damaged by fire following an apparent arson attack last year. Plans include seven one-bedroom flats and include re-rendering the building, re-roofing and new windows. Planning documents seen by West Leeds Dispatch indicate no parking spaces are proposed in the plans, but there will be seven cycle spaces. View the plans in full here. Comments on the application should be submitted to Leeds City Council’s planning department by October 2. The building was originally a Providence Sunday School but was converted and opened as Carr Croft Cinema in 1912. It forms part of a site earmarked for a new 90,000 sqft supermarket. 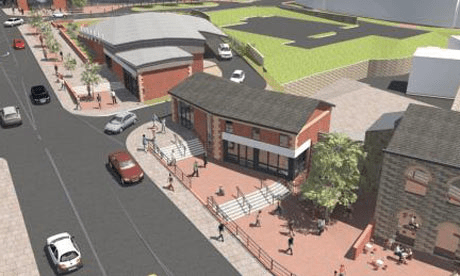 The plans – for a supermarket raised on stilts with more than 500 car parking spaces, a petrol filling station and shop, three new retail units and new “town square” – were approved in principle by the council in 2011. It’s believed either Asda or Tesco were in negotiations with the developer, Morbaine, at the time but, according to Armley ward councillor Alison Lowe , the plans were shelved due to the recession. Given the seven cycle spaces,they obviously ar’nt being built with the elderly in mind, is this what is really needed given the current situation on town street.